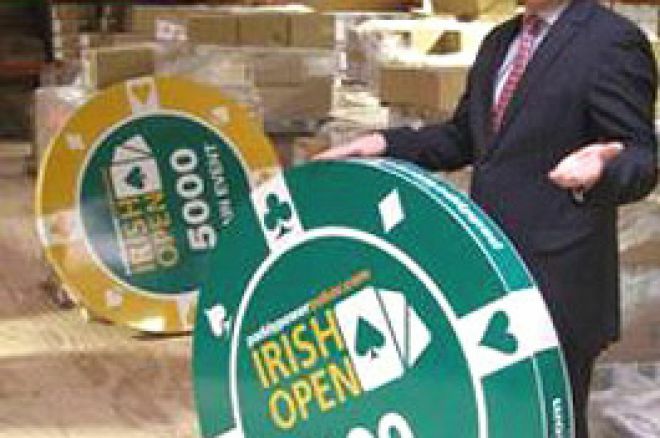 Paddy Power Poker made a slight error when it came to ordering 40,000 chips for the Irish Poker Open, to be played out over Easter weekend. If you're heading to Dublin this week you can rest assured of a big starting stack! In a press release issued to UK PokerNews this weekend, Paddy Power Poker admitted their €2,000,000 guaranteed Irish Poker Open was in disarray. 39,750 forty inch novelty chips, destined for use in the tournament, were delivered to the company after an administrative blunder. The chips, which arrived in twelve forty-foot containers and are currently being transferred to storage, were ordered in error and the company now has less than one week to find 40,000 usable alternatives. A red-faced Ross O'Mullane, Poker Marketing Manager, said, "Poker chips are always 40mm wide, it is an industry standard. I signed a booking form with American company Novelty Chips-n-Tricks, not noticing some inverted commas after the number 40." Company bosses, including Paddy Power himself (pictured with one of the giant chips), have warned Mullane that his job is on the line unless he can come up with a use for the 1 metre sized chips! Mullane shrugged off the pressure, though. "These chips are truly huge, we're looking at having a giant card game in a field somewhere, or maybe we could build shelters for homeless people." he said. The €2,000,000 guaranteed Paddy Power Poker Irish Open is set to be one of the biggest events in Europe in 2007. UK PokerNews will be there to bring you all the action, as it happens, from Dublin. The Tony G Invitational is Back!